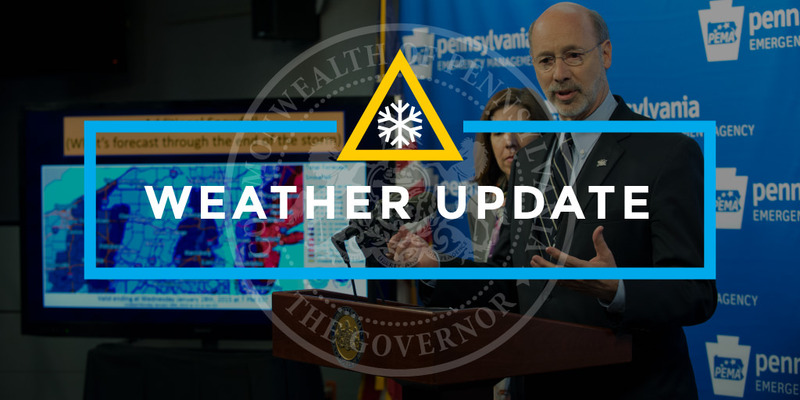 Governor Tom Wolf announced today that the Commonwealth Response Coordination Center (CRCC) remains open at PEMA as Winter Storm Harper exits the state, leaving behind snow and a rush of arctic cold air and gusty winds. Weather forecasts also indicate an increased chance of flash freezing on wet surfaces and blowing snow hazards in the northern portion of the state where snow was heaviest. The Pennsylvania Department of Health offers cold weather health tips and the National Weather Service offers a host of winter driving safety tips, including during extremely cold weather. The CRCC coordinates the deployment of state agency resources to counties that do not have the capability to respond as needed or have exhausted all available resources at the county level. The CRCC is staffed with personnel from PEMA and multiple state agencies, including the departments of Transportation, Conservation and Natural Resources, Environmental Protection, Fish and Boat Commission, Game Commission, General Services, Health, Public Utility Commission, Military and Veterans Affairs, Health, PA State Police, Human Services, Revenue, and PA Turnpike, as well as the American Red Cross and Civil Air Patrol. Other state agencies are on notice to report if needed. Governor Wolf signed a state of emergency declaration Friday. PennDOT imposed speed restrictions and a ban on all commercial traffic, including buses on most interstates and the Pennsylvania Turnpike, but many of those restrictions have been lifted. The ban remains in effect on Interstate 79 north of Interstate 80; Interstate 81 north of Interstate 80; Interstate 84; Interstate 86; Interstate 90; Interstate 380; and Interstate 476, the Northeast Extension of the Pennsylvania Turnpike north of Interstate 80. The bans include all commercial traffic, including buses, though tow-truck operators were permitted to perform their operations for motorists. See the most current map of bans and restrictions here. State officials continue to urge motorists to use caution in the aftermath of the storm, postpone travel if possible, reduce speeds and be aware of the potential for rapidly changing weather and roadway conditions throughout the day and overnight. The Pennsylvania Public Utility Commission (PUC) reports that as of 8 a.m. today, utility crews are working to repair about 4,000 outages scattered across the state. Utilities and the PUC are also continuing to monitor for any new problems related to wind and ice as conditions change today. Pennsylvanians are encouraged to monitor state agency social media accounts for the most up-to-date information on any emergency or weather-related situation affecting the state, in addition to any social media accounts for your local emergency management offices.